When you fetch a message from SQS queue you can specify how long this message is not available to any other consumer or any other fetch request. This time can be the maximum time your consumer will take to process a message. Before we dive into the real code there are few things you need to know. I am a huge huge huge Docker fan so everything we are going to discuss and develop in this post will be within Docker containers, so you need to have some understanding of Docker and Docker-compose. There are tons of articles available online detailing the benefits of using Docker containers. 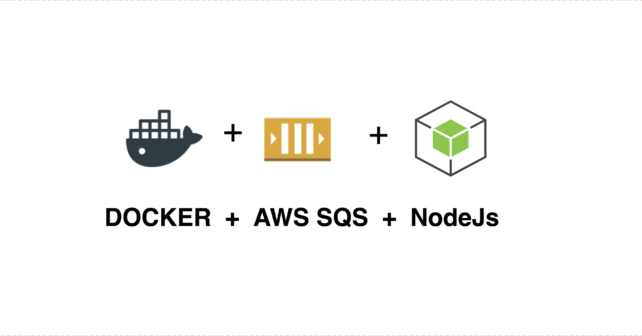 We will use NodeJs based consumer to interact with our AWS SQS, however not every team has the luxury to have AWS SQS queues available for development, so we will use elasticmq. Elasticmq provides the same interface as AWS SQS, so our code will work with real AWS SQS without any change. Following is the architecture diagram of our setup. The awesome developers at softwaremill has already created a docker image of elasticmq which we can use. Create folder named “docker” in your development folder. We will use this folder for managing files related to all the supporting docker containers. In this “docker” directory create a folder named “elasticmq”. Within the “elasticmq” folder we will create two files, Dockerfile and elasticmq.conf. // requests to generate queue URLs. 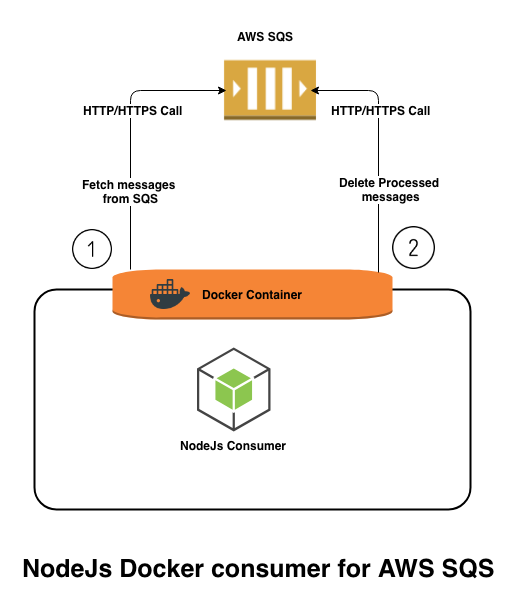 To work with NodeJs we need to have npm so that we can manage our project dependencies, however we will not install npm on our development machine but we will use nodeJs docker container to run npm commands. We have setup few environment variable for http and https proxies, you can ignore them, they are required if you are working behind a corporate proxy. If you notice, when the handler is called it will receive the message as well as a callback function. When we finish processing the message we need to call the callback function and it will delete the message from SQS. Consumer will poll the queue every second and process the message received. Lets write our Dockerfile to build and run our nodejs consumer. After this command you should be able to see the log messages on the terminal and your consumer will be polling the queue for messages. Now we will work on writing messages to the queue. Now we will use docker-compose run command to run this script and push a default message to our queue. To run this script we need to know the name of the container we gave to our nodejs consumer i.e. my-sqs-consumer. Run the following command and it will post a default message to your queue. Your consumer should receive the message and log in on your command prompt. Full source code of for this post is available on my github repo here. Please feel free to ask any question in the comment section below. it is simply awesome. I have used AWS SQS, it is very impressive and efficient. And Docker is very hot in the market, it reduces the Dev Effort and provide us lots of environment at the same time. It also resolves the problem of different running environment. Now I am looking forward to Node Js. Good going Aman, let me know if you need any help. Traveller, Foodie and electronics enthusiast.